Savings Plugin is a free browser add-on which is supposed to help you save money when shopping on the Internet. The program is compatible with Internet Explorer, Mozilla Firefox, and Google Chrome. In the case of the latter, you have to activate the browser add-on to get it to work. Savings Plugin is promoted on savings-plugin.com and is also bundled with other free programs. The browser add-on was built using the Crossrider engine, which is widely used by soft creators. Savings Plugin is published by Innovative Apps, also known as Engaging Apps and 215 Apps. This software publisher is notorious for many identical browser add-ons, including Savings Hunter, SlamDunk Savings, and many other browser add-ons. 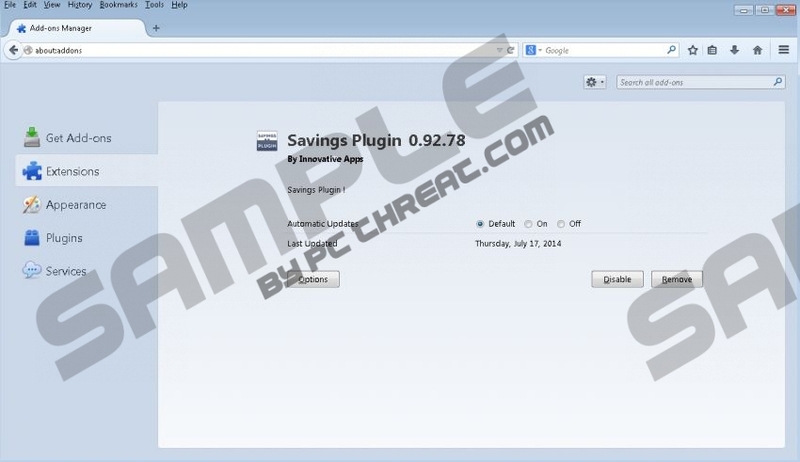 Savings Plugin is an ad-supported program, and it displays third-party advertisements, including coupons, web banners, pop-up advertisements, pop-under advertisements, and in-line ads, which pop up on commercial and non-commercial websites, including eBau, Amazon, Walmart, Target, Best Buy, YouTube, and other websites. According to the official website, this adware program can save you hundreds of dollars, but you should keep in mind that this program may also cause some damage. The program itself is not harmful but the pop-ups displayed by this program may redirect you to some malicious websites. It is so because Savings Plugin is not liable for the content displayed on your screen and the privacy policies of third parties. You interact with Savings Plugin at your own risk, which is why we strongly recommend that you remove Savings Plugin from the computer as soon as you can. Even though some of the advertisements provided to you by Savings Plugin have nothing to do with your interests, the adware program is recording your online actions. In order for the developers of the adware program to determine your browsing patterns, Savings Plugin records your clicks, impressions, search terms, browsing history, time spent on the website you browse, browser settings, and other non-personally identifiable information. The information collected may be used for various purposes, including advertising and marketing, and, if you want to prevent targeted advertisements, you should remove Savings Plugin from the computer as soon as you can. Our below given instructions should help you uninstall Savings Plugin from the computer but you should also shield the computer from various threats. Our team recommends using SpyHunter because this real-time security tool can easily remove Savings Plugin from the computer and fight off many other malware programs, including Trojan horses, browser hijackers, ransomware infections, worms, etc. If you want to be secure on the Internet, take action right now to remove Savings Plugin for good. Move the mouse to the bottom-left corner of the screen. Having removed the adware program from the computer, you should implement a reputable scanner because the computer may contain some malicious files. If any are detected, delete them manually or invest in the program to provide the system with protection against malware. Quick & tested solution for Savings Plugin removal.